Welcome to part 2 of my favorite recipes from 2012. If you missed part 1, you can find it here. Crumb cake – Ahh, crumb cake, how I love you. This version has just the right balance of cake to crumbs. You’ll find yourself sneaking back into the kitchen for bite after bite… or maybe that’s just me. Strawberries and cream scones – These scones may technically be more of a breakfast food, but they are so scrumptious that they should be dessert. Fresh strawberries and a vanilla glaze that seeps into the warm scones. I cannot wait for strawberries to be back in season so I can make these again. Peanut butter oatmeal chocolate chunk cookies – Peanut butter. Oatmeal. Chocolate. Enough said. Peanut butter oreo ice cream pie – This decadent ice cream pie is pure perfection. A thick oreo crust topped with homemade ice cream, hot fudge and some more oreos for good measure. No ice cream maker required. Apple pie bars – I absolutely adored these apple pie bars. Apple pie in a bite-sized portable form, made even better with a brown sugar shortbread crust and oatmeal crumb topping. Oh yeah. Pumpkin spice latte truffles – Truffles are always a crowd pleaser, but this pumpkin spice version turned one of my favorite fall drinks into a bite-sized dessert. Major win. Maple pecan biscotti – I made these biscotti mainly as a treat to bring to my grandma, but I ended up loving them myself. They are full of maple flavor and have just the right amount of crunch. Oh, and they are even better dunked in some coffee, milk or tea. Caramel apple popcorn – Warning, this stuff is completely addictive! You get all the goodness of caramel corn with just a hint of cinnamon and apple. Perfect for Fall, or anytime, snacking. 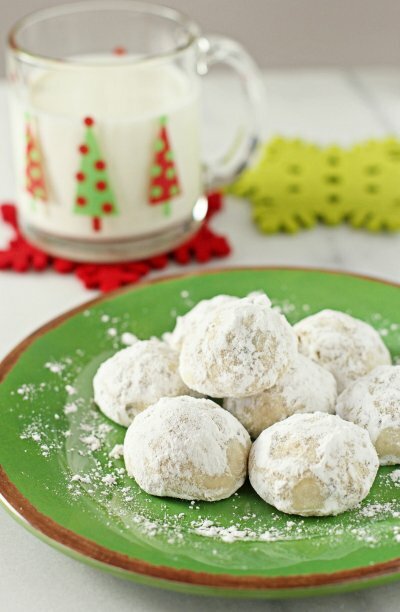 Snowball cookies – These cookies will always hold a special place in my heart, especially around the holidays. Traditional, melt-in-your mouth snowball cookies that have a little crunch from the walnuts and just a bit of extra sweetness from mini chocolate chips. Peanut butter fudge with chocolate swirl – This fudge, oh my. Peanut butter and chocolate combined into one creamy dreamy sweet treat. And it’s really easy to make too. So, that’s it. My favorite recipes from 2012. I hope you’ve enjoyed looking back with me. And here’s to 2013 – I’m excited to see what this year brings! Great selection! Happy New Year!! !